See more clearly on the road with Shield Wipes! Cleans bugs, dirt, and grime from face-shields, windshields and goggles. 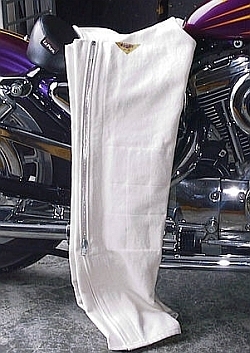 Our Hot Weather Denim Chaps Will Keep You Riding Cool! 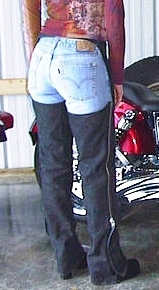 If you like to ride on hot summer days then our Hot Weather Denim Motorcycle Chaps are a must have! The Best Denim Chaps You'll Ever Own! Buckle or Velcro waist closures front and back. Zips on over shorts comfortably for full leg protection. Cut higher in the back of the leg to keep shorts tucked in. The only chap design with a flap of denim sewn between the zipper and the leg to avoid burning, chaffing or pinching. Weighs less than 2 lbs so they need less storage space. Eliminates the need to pack long pants for a weekend getaway which conserves precious saddlebag space. No more changing from jeans to shorts in the parking lot. Zips on over jeans to add a heavy layer of warmth. It's like thermal underwear on top so layers can easily be removed. Your jeans and the denim chaps equal two layers of heavy denim that will cut the wind. An additional (3rd) layer of denim with a layer of Kevlar® over the knees and shins gives extra wind protection where it's needed most. Your jeans and the denim chaps will absorb and hold your body heat. 100% cotton feels soft, warm and comfortable.